Hair Loss from Hair Dye: Is the Damage Done? Many people, especially women, use permanent hair dye for cosmetic purposes. There are many motivations: reducing the appearance of aging; making gray fuller and softer; fashion; enhancing an existing color; expressing one’s personality. Both doctors and cosmetologists are interested in the effect of these dyes and chemicals on the hair shaft. Can they harm the hair shaft or cause hair loss? Or are they completely safe? Frequent users of permanent hair dyes have noted that their hair can become damaged and dry, and even fall out. Hair care products that claim to help repair this damage are widely available. One study1 examined the lipid (oil) changes in the hair cuticle after permanent hair dye was applied. Using an electron microscope, the researchers found that the cuticle (the part of the hair that attaches to the scalp) at first became swollen when exposed to the dye. When the swelling started to go down, the cuticles began to degrade. The most severe hair samples had holes in the endocuticle, swelling in the lipid layer and even breakage. Over the course of a week, the amount of damage was lessened. Once the hair has been noticeably damaged, cutting the hair shorter can remove damaged sections and reduce the weight of the hair, so there is less tension and breakage. Taking a break from hair dyes or switching to temporary, natural dyes can also help. Additionally, a professional hair stylist can offer advice. 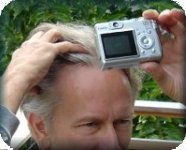 If hair loss continues after quitting the dyes, a dermatologist should be consulted in case the hair loss has another cause. This entry was posted in Hair Health, Hair Loss, Hair Loss in Women on September 29, 2009 by Larry Shapiro.